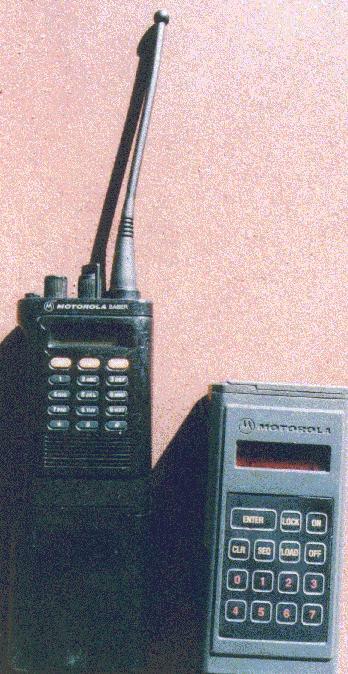 Motorola DVP T3010BX Code Inserter (without battery pack). Below is a ruggedised secure Saber (with speaker mike). These are often used for military applications. In this context DVP stands for Digital Voice Protection DVP (tm). DVP(tm) is a Motorola Inc encryption system widely used in the USA and many other countries around the world. 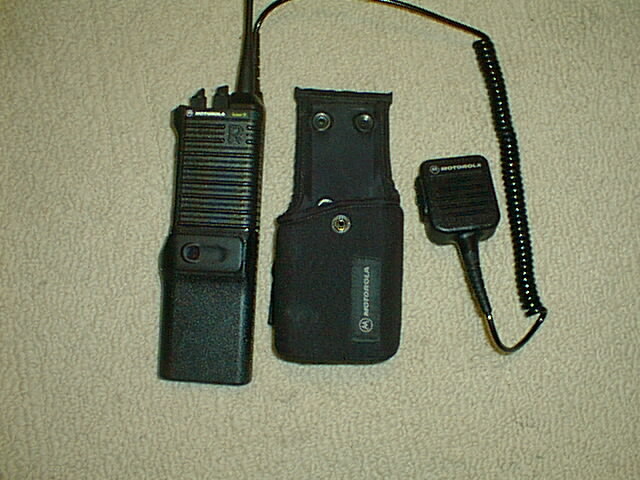 Using DVP(tm) Two-Way radio users are protected from eavsdropping through encryption of their signals. DVP(tm) is just one of several scrambling systems sold by Motorola Inc.
Fascinator A more secret system apparently used by various US Government users for national security applications. Indictor A digital scrambling system often used by military and federal law enforcement users in the USA. Note: In US patent No: 5,363,447 it is stated that DVI-XL is more secure than DVP-XL. To the recreational radio scanner listener DVP transmissions can often be identified by the unusual "white noise" or "static" sound. This noise is similar to that of having an open squelch. The noise is in fact that of "data" being sent at 12kbps. In Australia DVP and DVP-XL is mainly used by Government bodies. I understand however that prawn trawlers in the North of Western Australia were also using the system, perhaps there are other civilian users in Australia as well? Is this gear available to the public? A few years back there was a realisation that DES might be getting a little dated. A group in the USA called EFF (Electronic Frontiers Foundation) built a machine which can find a DES key in several days. The details of the machine were published in a book called "Cracking DES". The hardware was custom built and used purpose made ASIC. The VHDL used to describe these ASIC s, schematics, programs in C were all included in this book, the idea being that anyone could (in theory) make there own machine. Perhaps this will result in DES based radio encryption gear being replaced with stronger encryption schemes? The DVP Code inserters shown in the above photographs are used to load a secret key into a DVP compatible radio. The key is entered into the Code Inserter by way of the keypad. The key is transferred from the Code inserter to the radio using an interface cable. (The interface cable is described in the "batwing" link in the links section). (b)The key is loaded into compatible radio Number "1"
(c)The key is loaded into compatible radio Number "2"
0 ErASEd This indicates that key memory number 0 is empty. LOAd _ This occurs after the LOAD key is pressed. The Code Inserter is prompting for a memory location. 4.1 121394 This is a typical screen when loading a key. It indicates memory number 4, line 1, and the first six digits of the key are 121394. The case resembles that of the MX series handhelds. 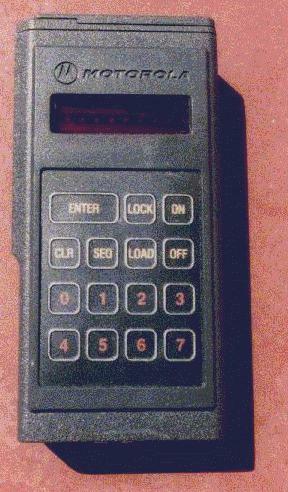 The keypad is a membrane type, similar to that found on the old Sinclair ZX-81 computer or the keypad on some microwave ovens. *There is a PTT style switch to load the key, even when the Code Inserter is turned off it "wakes"
when this switch is depressed. Syntor X 9000 .........please let me know if you have a complete list..
XTS3500 Handheld radio capable of being equipped with Fascinator(tm) or Idictor(tm). A 24 digit number is entered using the keypad for each key. In fact 271 is equal to 2.3612*1021. The process where a 24 digit number is converted to 71 bits of key is unknown to me. 71 is an unusual length for a key. There are a number of keys that are prohibited by the DVP Code Inserter. Thanks for visiting this page, please e-mail me at radioencryption@hotmail.com if you can help with any information or have any comments. (b) Even if I did know how (which I don't) I don't want to compromise the security of the networks that use this gear. *If you feel that I have revealed information about DVP or any other encryption that I should not have done, please let me know and I will remove it ASAP.